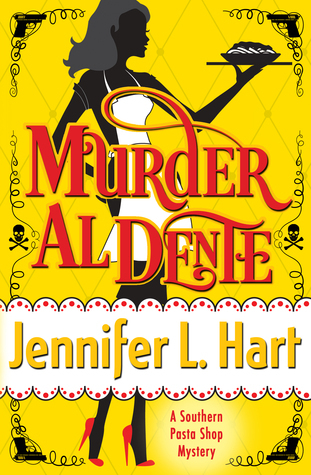 Jennifer L. Hart’s Murder Al Dente is a mouth-watering murder mystery combining wit, humor, and romance; one of my favorite books of the summer by far. After a disastrous debut on a television food channel, Andrea Buckland returns to her family-run pasta shop, The Bowtie Angel, in North Carolina. But her road home isn’t smooth sailing. A car crash, some hard financial facts, and discovering a dead body litter Andy’s first few days back in Beaverton. On the plus side, there is Malcolm Jones – a handsome new guy in town with surprising connections to the community. In a very short amount of time, I’ve really fallen for Jennifer L. Hart’s writing. From cozy mysteries and romance, to science fiction and fantasy, she masters is all. Her stories are always funny, captivating, and attention-grabbing. In addition to all of that, Murder Al Dente includes some seriously appetizing pasta recipes that enhance the story that much more. I’m very impatient for more from Andy, Jones, and Jennifer!